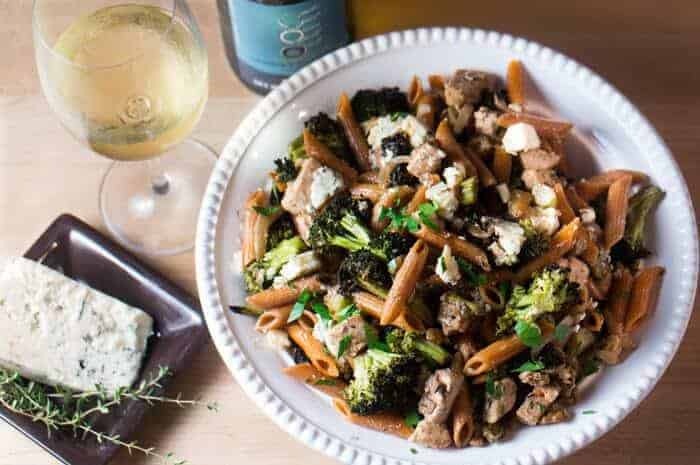 Chicken, Roasted Broccoli, and Bleu Cheese Penne has bold flavors that pair perfectly with bleu cheese. There’s nothing subtle about this dish! What’s the first thing that comes to mind when I think of bleu cheese? Why, wine of course! 😆 Well, I am able to think of quite a few pairings that make my mouth dance: Bleu cheese and walnuts, bleu cheese and caramelized onions, bleu cheese and thyme… Take Me to the Recipe! 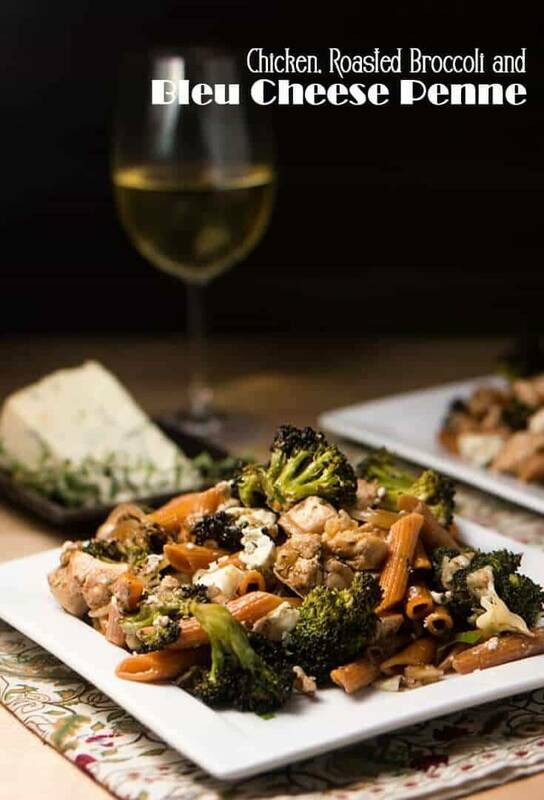 Chicken, Roasted Broccoli, & Bleu Cheese Penne brings these luscious ingredients together in a glorious cacophony of flavors. My mind does naturally go to wine when I think of bleu cheese, and it is not an easy pairing. Bleu cheese is rich, salty, and a bit dank, and I guess an off-dry and somewhat acidic white is a “proper” choice with a hunk of bleu cheese. I’m not inclined to keep them in my wine rack, and with the strong and complex flavors of the dish, I’d not recommend a bold, full-bodied red wine (ie. cabernet sauvignon). Last month when I went back to Las Cruces to visit, my kids suggested we make “that bleu cheese pasta.” I had to laugh at myself. 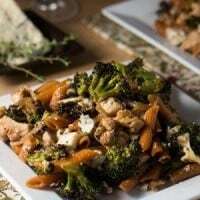 It was several months ago that I made Chicken, Roasted Broccoli, and Bleu Cheese Penne several times because I wanted to post the recipe. Lol. I completely forgot about it with our move and subsequent internet issues. Fortunately, I had a few notes, but I felt like I needed to make it a couple more times… We just had to suffer through the experience! My husband Mark likes to prompt me to suggest substitutions, and I typically include them. In this case, however, the specific combination of flavors is what makes this dish “work.” Roasting the broccoli with just a bit of grated parmesan is key; substituting “kale” (my husband’s idea) would fall short. Replace the bleu cheese? Please do not! If you just can’t stomach bleu cheese, leave it out; it is still a good dish. I’d hate to have you miss the bleu cheese/toasted walnuts, bleu cheese/caramelized onions, bleu cheese/sherry perfect pairings! In all honesty, I’d not miss the chicken, but I don’t want to see #wherestheprotein when I post the recipe. 😯 I will include #meatlessmondays. My work flow goes something like this: Get the broccoli prepped and roasting. Start the onions caramelizing, then put the pot of water on to boil for the pasta. Cube the chicken and add to the onions, stir the roasting broccoli, and complete the sauce but do not add the bleu cheese. 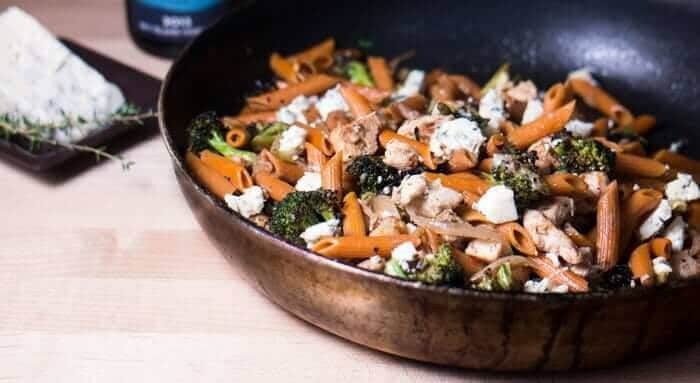 When the broccoli is tender, and the pasta is al denté, combine it all in your large sauté pan or pasta bowl. Fold in the crumbled bleu cheese just prior to serving so that it only melts slightly and doesn’t incorporate into the mixture. Serve hot or just warm. As I mention in the notes, this is a super flavorful vegetarian dish with the omission of the chicken breast. I’m taking an informal survey… how many of you love bleu cheese? P.S. If you’re looking for more wine-cheese pairings, you’ll love The Ultimate Shopping List of Cheeses for Wine Lovers! 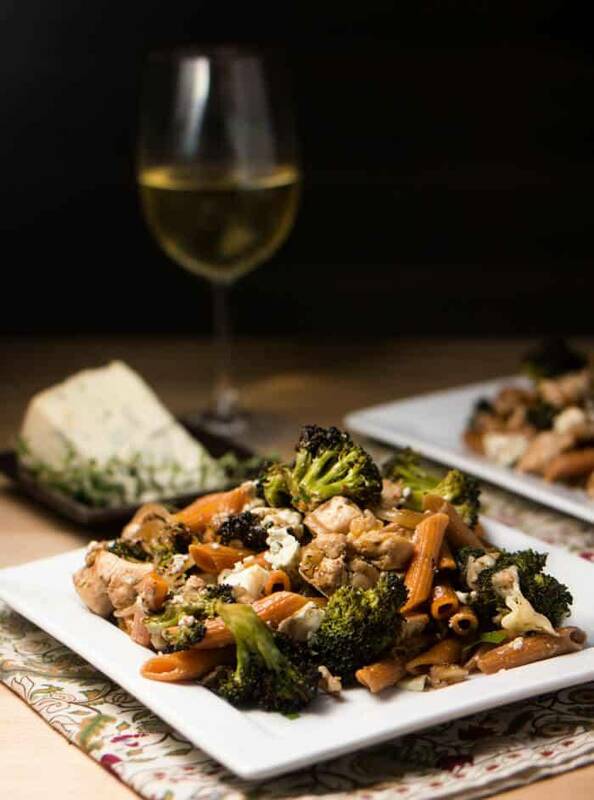 Chicken, Roasted Broccoli, & Bleu Cheese Penne has bold flavors that pair perfectly with bleu cheese. There's nothing subtle about this dish! Preheat your oven to 400 degrees. Arrange prepared broccoli in a single layer. Drizzle with olive oil. Season well with salt and pepper. Place in hot oven. Heat a large saute pan over medium-high heat. Add a drizzle of olive oil, the minced garlic, and onion. Stir to combine. Continue cooking over medium-high, heat stirring occasionally, until onions begin to caramelize. Give the roasting broccoli a good stir, and continue to cook. Add cubed chicken breast, thyme leaves, and crushed red pepper to the saute pan. Cook until chicken is browning nicely on most sides. De-glaze the pan with the sherry. Stir. Cook until about half of the liquid is evaporated. Meanwhile, cook the pasta according to package instructions. Prior to draining it, reserve 1 cup of the pasta water. Check the broccoli. When the broccoli is almost tender, sprinkle with parmesan, and cook an additional 5 minutes. The total cooking time for the broccoli can be anywhere from 25-45 minutes depending on your oven and the size of the pieces. It should be tender, but not soft when you pull it from the oven. Add sun dried tomatoes and walnuts. Stir well. When the pasta is al dente, drain, and add to the saute pan. If the pasta seems dry, add some of the reserved pasta water. Immediately before serving, gently fold the crumbled bleu cheese into the pasta mixture. Garnish with fresh thyme and chopped parsley. Buon appetito! I love flavorful vegetarian dishes, and this is excellent without the chicken... A perfect vegetarian pasta. Barilla Veggie Penne provides 1 serving of vegetables and beautiful color to this dish. Use your favorite! Don't waste the stems. Peel them with a vegetable peeler, and chop into 1/2" rounds. Break the bunches into florets. I specified parmesan because that is the hard cheese mostly likely in your refrigerator. Pecorino romano and asiago are suitable substitutions. Dry sherry does wonderful things to the caramelized onions. Substitute dry white wine or chicken broth if you must. Salt the pasta water generously. I use my palm to a pot full of water. Macronutrients (approximation from MyFitnessPal.com): 642 calories; 44 g protein; 61 g carbohydrates; 26 g fat. The servings are VERY generous. I made this with garbanzo beans instead of chicken, and it was fantastic. The flavors in this dish sound so good! I can see enjoying this with my husband and a glass of wine after we put the kiddo to bed. It would be perfect for a date night! Thanks Rachel! Do you deliver?! This looks amazing! Wish it was my dinner this evening! Haha! I wish I could accommodate :-) I love to cook for people, and since moving to south Texas 4 months ago, have had no opportunity to do so. Merry Christmas Annie! You don't need it delivered. Having eaten this recipe many times and assisted in preparation, its too easy to have someone do for you. Because Tamara is a fantastic writer and her recipes are easy to fallow, you can make nearly everything on the blog yourself with ease. She is a phenomenal cook, but don't let that intimidate you. You had me at blue cheese!! And roasted broccoli!! Love both of them & this sounds delicious! I am a big fan of "stinky feet cheese" and I will pair anything with wine! LOL! This dish is beautiful and it sounds delicious. Definitely on my "make it" list. Yay! It does seem to be a polarizing ingredient... I'd rather have a glass of wine and a hunk of bleu cheese than just about anything ;-) Thanks Emme! This looks absolutely delicious! What a perfect weeknight meal. Can't wait to try!! I think it's funny that they're picky but eat bleu cheese! Nils refers to it as "stinky feet cheese," and I don't put it in anything when I'm cooking for him. Gerritt used to feel the same, but they do cheese tastings at the CIA, and he's learning to like it. Yay! Count me in as one who loves bleu cheese!